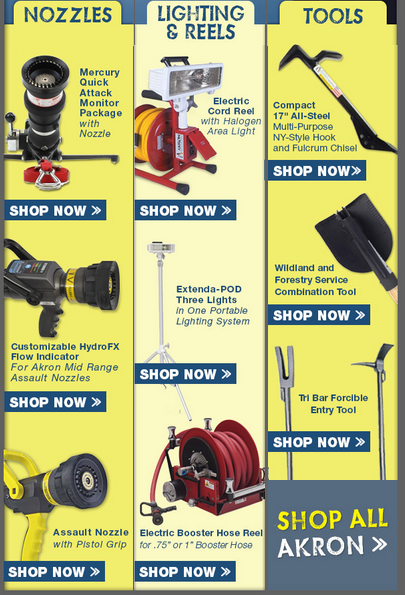 On Scene: 10% off all Akron Tools, Lighting, Nozzles & Equipment! 10% off all Akron Tools, Lighting, Nozzles & Equipment! Hear ye, Hear ye! An amazing deal is to be had...right now we're offering a killer sale on all Akron Equipment, bringing it to you at 10% off for a limited time! What does Akron sell? Well, what don't they sell? They make nozzles, lighting systems, tools, shovels and portable scene lighting. This is great quality stuff you can rely on and that will last for years to come! Check out the full list of products on the Akron Manufacturer page, and don't forget, at 10% off products such as these, that's a great deal. So be sure to check out your firehouse needs. Could you use more nozzles? A better hose reel? Forcible entry tools? Or possibly some better on scene lighting? Now is the time to get that order in. Shop the Akron 10% off sale now.